This is our wonderful A-line dress shown here in lime gingham, light blue gingham, light pink gingham and Paris Village Stroll. 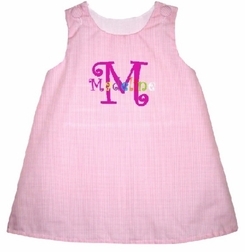 This cute little dress can be ordered in any color gingham or specialty fabric listed, and is made with covered buttons. 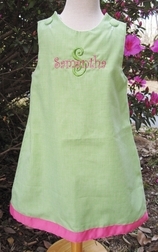 If you choose bows on the shoulders, they will be made with grosgrain ribbon of your color choice. 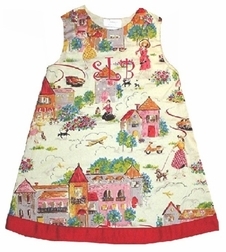 You may also embellish the hem of the dress with ribbon or pom poms. 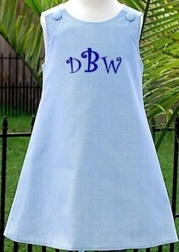 A monogram just looks adorable! For A-lines made with toile, see our Toile A-line in this Section.